There continue to be new advances in all facets of medical care, and that certainly includes treatment of the foot and ankle. I would like to discuss a few of the revolutionary ideas that have become important and effective treatments in foot and ankle care. 1. Alcohol sclerosing injections for Morton’s neuroma. Historically, a pinched nerve at the ball of the foot has been treated with cortisone injections, custom orthotics, and special pads under the foot. If this failed to relieve the symptoms, surgery was usually recommended. We now have a very viable alternative to surgery that works effectively in most people; in fact, studies show a success rate as high as 89%. The treatment is a series of alcohol sclerosing injections. The dehydrated alcohol injections have a high affinity for nerve tissue and are used to “deaden” the nerve impulses in the diseased nerve. Especially for people who would like to avoid the potential risks associated with surgery, this series of injections has proved to be an effective alternative. 2. Topaz coblation radiofrequency treatment of tendons and plantar fascia. Tendonitis and plantar fasciitis are often treated with oral anti-inflammatory medication, stretching, icing, activity modifications, bracing and taping, cortisone injections, and physical therapy. Most people get better with these treatments; about 10% do not. The Topaz procedure has been developed as a minimally invasive alternative to open surgery, with a sports medicine background. It includes a probe that is inserted into the damaged area of tendon or fascia, under light anesthesia. The low temperature radiofrequency treatment initiates a healing process of the chronic tendonitis or fasciitis. The Topaz procedure has been developed as a minimally invasive alternative to open surgery, with a sports medicine background. It includes a probe that is inserted into the damaged area of tendon or fascia, under light anesthesia. The low temperature radiofrequency treatment initiates a healing process of the chronic tendonitis or fasciitis. 3. Bleomycin treatment for plantars warts. Warts on the bottom of the foot, termed plantar verruca, are a viral infection in the outer layers of the skin. Traditional treatments include acid patches and anti-viral creams. Freezing or burning the warts are often the first line treatments in doctors offices. This will often work; in some cases it does not penetrate deep enough to eliminate the plantars wart. People often talk about a wart “coming back”, however in most cases, the wart was not fully eliminated. Bleomycin is a highly effective injection used to eliminate warts. We deliver the injection using a Dermo-Jet “needle-less system” (there is no needle; it is delivered via an air-pressure syringe). There are several other recent advances in the treatment of the foot and ankle, all of which are exciting and proving to be highly successful, including wound care alternatives and surgical techniques. I look forward to discussing these advancements in a future article. 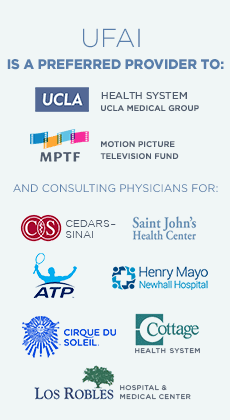 If you would like more information on any of these treatments, or to talk with one of our nationally recognized experts, please call (877) 989-9110 or visit us at www.footankleinstitute.com. After studying accounting and then leaning toward a physical therapy at Brigham Young University, Dr. Franson decided to pursue podiatry as his career. He then attended the School College of Podiatric Medicine in Chicago. Upon graduation in 2001, Franson accepted a three-year residency program at the Greater Los Angeles VA and UCLA County Hospital. Dr. Franson specializes in several areas including total ankle replacement and sports medicine. Previous: Ankle Arthritis and Ankle Replacement, UFAI’s Next Free Seminar! This is good news for people having problems with their foot or ankle. In this busy world, we make use of our feet going here and there. It is one of the most used part of our body that we have to take care of!